What a gem we have. These guys know their beer. I've tried a lot of great beers based on their recommendation. Lot's of hard to find beer. This has become my go-to beer store. I enjoy visiting with there people too. My first review of this place in 2010 was far from stellar.Out of date bottles and a mediocre selection.Staff just wasn't knowledgeable about craft beer.Recently though things have changed.New ownership and completely new experience.Large quality selection,accommodating service and more knowledgeable employees.Great turnaround on this place. I wasn't blown away by the selection, but I'm probably jaded. There are a lot of options, though, in both 4/6-packs, bombers, 750s, mix-sixes, a few variety packs, and those monster macro cases, if you're in need (some 4/6-packs were cold, all 95% of 750s/bombers were not in the coolers). They had local stuff from the MO side of the river (4 Hands, Perennial, Schlafly) and other brands not available in MO (Ballast Point, Dark Horse, Smuttynose, Uinta). Prices were reasonable and the staff was friendly--I was approached by three different people when I went in there the second time; none of them were pushy or annoying, just curious if I needed assistance. This place is definitely worth stopping in if you're in the area. I stopped in on a friend's recommendation. The interior reminds you of a cheep, almost dumpy "liquor barn" (which from what I hear, is about right) but the new management is on their game. I live on the Missouri side and the clerk was very quick to point out which items I was unable to purchase locally. Very friendly, knowledgeable, and willing to try and order anything they didn't have. Some of the dates on the shelf items were from '12, but that might not be a bad thing if one is looking to purchase something that can be aged for a year or so. It is too far from my house for a weekly visit, but certainly any time I am in the area, I will stop in! I am happy to announce that after years of neglect, bombed out beer, and insane prices...Corral has now been bought by people who actually care about craft beer. Great selection, outstanding prices and they really want to make it work. I suggest anyone on the east side go check it out. Let's support this indie local because this is a great thing for all craft fans. March 2016 edit: This is now the best place to get beer in the Alton/Edwardsville area. Pretty much everything you could want from the STL area and some great picks that you can't get in Missouri. Also, all beer is cold now since the installation of the beer cave. Mike and Joe have done a great job! I've lived in the area my whole life but havent been there in over a year untill recently and they have re done the whole store with more coolers and more microbrews, the place is just immaculate compared to what it used to be. I rarely used to shop here because some of their stuff is a little pricey but if you are buying bulk the owners will give you a hell of a deal on a case opposed to buying 1 bottle. I was buying alcohol for my friends bachelor party and got a keg of Pabst 4 18 packs of bud and a case of canadian mist. the guy gave me a discount on the case of vodka plus free shooters and had this kid take everything to the car for me lol they even have a drive through so you dont have leave your vehicle. my only complaint is the deposit on the keg was kinda high but they gave it back when I returned the keg and tapper. Having bought beer on several occasions at the Corral in Granite City, I thought I would give this place a try. They have an ok selection of six packs, four packs and a few random bottles. They do have a build your own six pack section but the selection is awful. You cannot take any bottle from any six pack for an individual price like in Granite City. You have to pick from the weak selection they have on the shelf. You can choose from a few Sam Adams, Schlafly, Boulevard, and Abita as well as some mass produced imports. Nothing special about the beers in the mixer sixer section. You pay a flat $9.99 for all mixer sixers or $2 for any individual bottle you want. In the back of the store, you will find a few single bottles, and several six packs. There is an ok selection here but my main complaint is the outrageous pricing. A 500mL bottle of Hobgoblin (which is not that special of a beer) costs $5. A 4 pack of Founder's Curmudgeon was $19.99. One six pack that was reasonably priced was Hibernation ale for $11.99. On a more positive note, the staff were friendly, helpful and willing to help me find what I was looking for. Overall, I would avoid this place unless it is inconvenient to travel to Granite City. Zero expectations based on the prior reviews... plenty of times there's the potential for good finds in unlikely places, but certainly not getting any hopes up. The place looks tiny from the front, yet is very deep. Carpeted aisles up front, musty funk, and astronomical liquor prices. Beer is far in back, away from sunlight = good. Case macro beer takes up the back area = not so good. Dusty aisle of import singles and sixers on the way to the beer area. Craft six packs line the wall in the back, and a couple shorter shelves in the center. Nothing too exciting, some seasonals, but not a bunch. Founders, Schlafly, Boulevard (old Saison, no other smokestacks), Flying Dog, Goose Island, etc. Usual suspects. Looking at dates, Schlafly seasonals are less than 3 mos. old, though the mix-a-six area was terrible, all 18 mos. old or more. Coolers were sad, full of macro crap, 4 Loko, and Champale. One oddity was Hill Farms (?) Pilsner, one last sixer, which i've never seen before or since. The ladies working here were nice enough, though I got the vibe they weren't gonna hear no sass talk from nobody. Signs on the door mentioned their assortment of gag gifts for sale. Life is in the details my friends. This is the closest beer store to my house so I frequently shop here but would rather drive the extra distance to go to the Granite City location. They generally have a decent collection of six packs(Avery, Dogfish Head, Lost Coast, Left Hand, occasionally Three Floyds, Great Divide, many more). I always check dates on six packs as they have a slow turnover rate. No mixer-sixers here which is unfortunate. Decent prices on bombers here, $5 for Avery bombers, $7-8 on Hoppin Frog, $6 on Ommegang 750mL, $7 on Oak Aged Yeti, $5 on Lagunitas. Some imports including Chimay, Lindemanns, Delirium Tremens and Nocturnum. Overall an alright store but not great. The employees generally know very little but are nice and willing to help. Last time I was in I was picking up some bombers and a 750mL of Framboise which they were out of but the owner came over and said he would give me two 375mL bottles for the price of the 750. The best thing about this store is beers that sell out fairly fast at other stores will stay in stock longer here and sometimes you can find a gem. I would like this store alot more if they had mixer-sixers. From what I understand, the same people who own the Granite City Corral own this one too. The problem with this one is no one knows about it and it's in a bad town (Macro beer rules here). Quality is ok, but keep an eye on the dates. 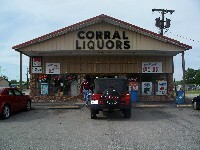 I've seen many bottles in this place that the other Corral used to carry a year or so ago. I don't have proof, but I think that the supplies at this store just didn't sell which is why they're still on the shelves. It is however nice when you're looking for certain things. For example, they had Bigfoot long after it was sold out everywhere else. In any case, they have a pretty nice selection. The imported selection is nowhere near that of Granite's, but the micro list is decent. It's not quite as good as Granite's again, but they carry a few things the other store doesn't. As far as service goes, well you might be better off helping yourself. There's always a guy who asks me if I need help, but I just say no. The girls at the register definitely don't know anything. I bought a 6 of Bigfoot and when it rang up $13.85 one of the girls picked a bottle out of the carrier to examine the "expensive beer". I suppose I can't fully comment since I never talk to the guy that asks if I need help. Who knows, he may be a beer genius and I just have been writing him off as a trash drinking local. A nice little spot, and it would probably get some better brews if they got more attention. Can't mix 6ers like at Granite, but no worries. You may run into a gem here that everyone passes up.